This walking tour is the best way to discover the most important highlights of Milan and the famous masterpiece by Leonardo da Vinci, the Last Supper, hidden inside the refectory of the church of Santa Maria delle Grazie. The entrance is allowed only to people with a reservation and our guided tour gives you the chance to see this fresco known all over the world! We will proceed to the Sforza Castle, the medieval fortress and ancient residence of the dukes of Milan, that now houses several museums and important art collections. The following stop is the enchanting Piazza dei Mercanti, a nice square away from the crowded streets. Here, in the medieval heart of Milan, you can breath the Renaissance atmosphere and live the illusion of space created by Bramante. Our tour goes ahaed with Piazza della Scala, house of the Scala Theatre, one of the most important Opera Houses of the world, erected in 1776. Some of the most famous singers and musicians have performed here. Among the others, Giuseppe Verdi, Rossini, Bellini and Donizetti. 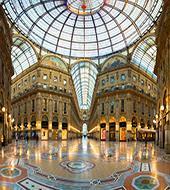 We will cross the grandiose Galleria Vittorio Emanuele II, a wonderful glass vaulted arcade built is 19th century reach of fashion shops and cafés, also known as the “Milan’s drawing room”. In fact this is a very important meeting point for the Milaneses. Finally we will visit the Duomo (only exterior), the famous cathedral symbol of Milan located right in the centre of the city, considered as one of the most beautiful churches in the world. 15 minutes before the tour starting time in front of the entrance to the Leonardo’s Last Supper or in front of the central door of the Duomo, according to the tour starting time. More information will be provided after the reservation.